"Charming and Beautiful Despite Dramatic Flaws"
In CHRISTOPHER ROBIN, Christopher is all grown up and has forgotten the wonders and joys of life, but when Pooh surprises him, everything changes. CHRISTOPHER ROBIN is charming and has a strong moral worldview about making family first, along with some amazing cinematography and special effects, but the plotline is weak. In CHRISTIOPHER ROBIN, Christopher is all grown up and has forgotten the wonders and joys of life, but when Pooh surprises him, everything changes. CHRISTOPHER ROBIN is charming and has a strong moral worldview about putting family first, along with some amazing cinematography and special effects, but the plotline is weak. As a young child, Christopher Robin would play with Pooh, Tigger, Eeyore, Piglet, and others in the Hundred Acre Woods. When Christopher Robin is sent away to boarding school, he seems to forget these lovable group of friends. Years pass, and Christopher Robin grows up, marries and has a little girl named Madeline. However, Christopher Robin has forgotten how to be joyous in life. He works all the time at a luggage factory and hardly spends any time playing or enjoying his family. As an efficiency expert, he has to figure out a way to lower the costs of production for the luggage company. Christopher’s boss tells him he has to work on this over the weekend and that everyone in the division will be fired if he doesn’t cut costs 20 percent. So, Christopher cancels his plans to go away with his family for the weekend. After his family leaves, Christopher Robin hunkers down on working. Meanwhile, Winnie the Pooh has lost his friends and enters Christopher Robin’s old door in the woods to try to find Christopher Robin to help him. Surprisingly, the door leads Pooh to London, right outside Christopher Robin’s house. When they run into each other, Christopher Robin is completely perplexed how Pooh has gotten there. He decides to hurriedly help Pooh get back to the Hundred Acre Woods. The adventure begins as Christopher Robin and Pooh return to the Hundred Acre Woods and search for their friends. CHRISTOPHER ROBIN has a strong moral worldview stressing focusing on family. Winnie the Pooh is a positive character for children, with his innocent nature and endearing positive lines about family and friendship. CHRISTOPHER ROBIN is beautifully done, with incredible special effects and almost painterly scenes. However, the movie’s plotline lacks some drama and structure. It’s almost as if the movie’s main focus is to be an ode to beloved characters rather than an actual storyline. First, the story’s goal is to get Pooh back to the Hundred Acer Woods. Then, one-fourth of the way into the story, when Pooh has returned to the woods, he needs to find his friends. Thus, the writers have to figure out how to make the rest of the movie interesting, when they’ve already solved the movie’s plot problem. As a result, therefore, the story’s resolution comes across as being too weak. That said, family audiences will be charmed by Pooh’s adorable comments and will laugh at Tigger and Eeyore’s antics, as usual. One character lies in order to get his way, and some sentiments against work are expressed or implied. 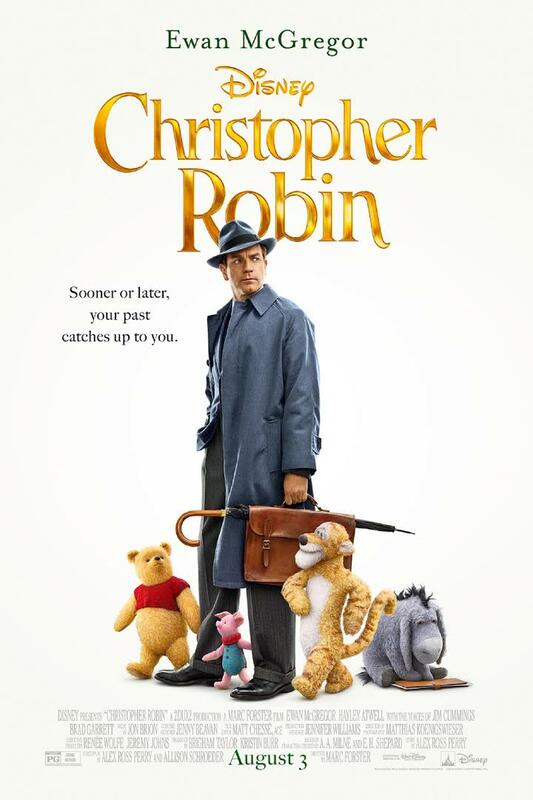 CHRISTOPHER ROBIN is a live action comedy about the real-life boy in the Winnie the Pooh stories. Christopher is all grown up. He’s forgotten life’s wonders and joys. However, when Pooh surprises him, everything changes. As a boy, Christopher loved playing with Winnie the Pooh, Tigger, Piglet, and the others in the Hundred Acre Woods. Years later, Christopher Robin has become a workaholic. He’s neglected spending time with his wife and daughter. When he has to work all weekend, he cancels plans to go away with his family. Will helping Pooh cost Christopher his job? CHRISTOPHER ROBIN has a strong moral worldview stressing family first and helping friends. Winnie the Pooh is a positive character for children, with his innocent nature and endearing positive lines about family and friendship. CHRISTOPHER ROBIN is beautifully done, with incredible CGI effects and almost painterly scenes. However, the plotline is weak. The story is more of a loving ode to beloved characters than a dramatic plot. That said, family audiences will be charmed by Pooh’s adorable comments and laugh at Tigger and Eeyore’s antics, as usual.